the little pumpkin on the kitchen table is special to us, because we joke it's "the pumpkin that started it all". Dave and I were engaged, were decorating our first house, and when I was at Hobby Lobby looking for something I picked up this little pumpkin. It was my very first piece of "seasonal decor" and will FOREVER be one of my very favorite pieces. McKinney recently got a Trader Joes and I picked up two of their little "seasonal bouquets" and then divided them up among a few mason jars and scattered them throughout the house. I LOVE having fresh flowers and this is a pretty inexpensive way to get several small arrangements. ... and this cute turkey from Pier 1. I picked up the cutest plates EVER (along with the matching cups) last weekend and the kids LOVE them! I think they're so sweet and festive and I know they'll be fun to pull out every November. I'll probably talk about it more in the next couple of weeks, but one of the things I'm most excited about is our new "Thankful Tree". It's actually an ornament tree from Pier 1, but as soon as I saw it I knew it would be perfect for this idea. At dinner, we talk about what we're thankful for and write it on one of the leaves or acorns. At the end of the month we'll be able to look back and talk about all the things we've been thankful for! That spot behind my stove is pretty bare, and I'm considering making a big turkey the same way I made my back to school apple. STOP IT!!! LOVE this little plate! And the little handprint! I picked up this sign at HomeGoods a few years ago and it's my favorite! And the whole reason I love decorating and making things special????? ... and I was WAY impressed!!! Today (and every day!) I'm thankful for these three, their dad and the memories we make on the daily. So, how about you??? Is Halloween still out at your house? Is the Christmas tree already up? Do tell! Looks great!!! The Christmas is coming out this weekend!!! I'm right there with you that I am bursting to pull down the Christmas decorations, but we're waiting until the weekend before Thanksgiving. That's as long as I can handle! Most of my Halloween decorations are multi-purpose for Thanksgiving too, so I had minimal switching to do. I just love the kids table that you created! I don't really decorate for Halloween just more "fallish" decor that takes me to Thanksgiving. But the Christmas tree goes up the weekend before Thankgiving. I can't wait to have it up! It's still fall over here....and then the day after thanksgiving it'll be christmas in here! House looks great girl!!! Your son Luke is very talented! Wow! I seriously wish I was your kid...LOL!!!! Looks like you go above and beyond to make everything so special for your little ones! I Love It! Christmas is up at our house(only inside)....I had some surgery last week so I'm on the road to recovery and thankfully will not have to worry the hubby about getting it up. I love how you decorate your home!! Wow! Looks great! I want the table runner you have on the kids table! Where did you get that? Tell Luke, he's a GREAT artist! Good job!!! Wow! You did a great job! I want the table runner you have on the kids table. Where did you get that? Tell Luke, he did a GREAT job coloring!!! Christmas will be up this weekend...inside, at least! Everything is beautiful! I LOVE the idea of the thankful tree! Love the decorations! I have pulled out some Thanksgiving decorations and am looking for some more. I need to take pics and blog about it. I take it one season at a time in my house! I bet your house is festive year round, regardless of decorations! And I love your Thanksgiving touches! My house is in transition too and there are some 'winter' pieces mixed with some traditional Thanksgiving pieces. I am just super antsy to get the Christmas cheer going!! Love the Thankful Tree idea!! So awesome! So precious!!! I love it all and am so happy to see others who decorate for Thanksgiving too. My favorite is your little handprint plate and the chalkboard quote you did. Darling!!! It looks so good! I just love your style :) The gobble till you wobble sign is pretty awesome! I did our Thanksgiving mantel on the 3rd! So far its the only spot to be decorated lol. Im loving the daily thankfulness talks, Thanksgiving is my favorite holiday. As always, everything looks so cozy, warm and perfect! I want to come over and color with your kiddos at their cute table! I LOVE your adorably warm home!!! So cheery and festive with the changing seasons. We still have fall stuff up in our house until after Remembrance Day here in Canada, then we change over. Love all your decor. The thankful tree is such a great idea, and the new PB plates are so cute. 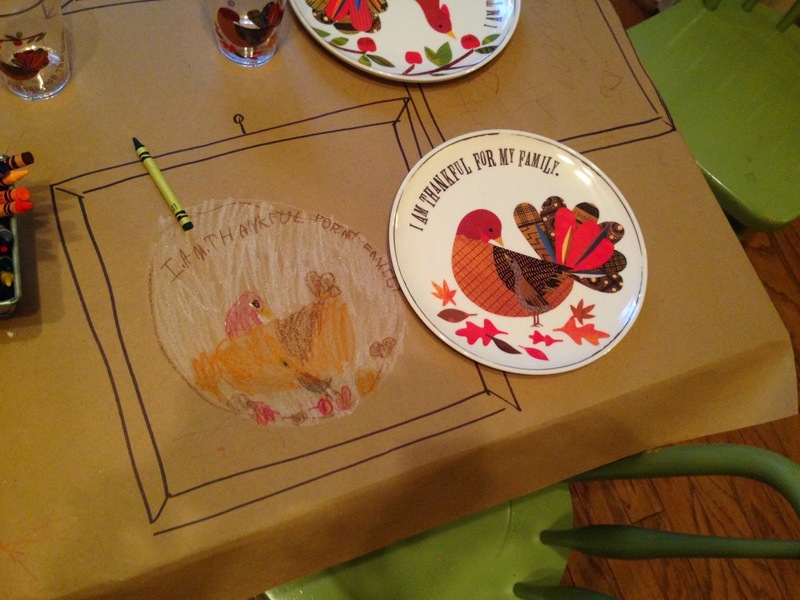 It's so fun for your kiddo's to have some brown paper to color on at the table. We took down our Halloween and just added a few Thanksgiving things...will be on my blog tomorrow for FF. Everything looks great! You always manage to make everything seem so special. This may be a silly question, but where do you find rolls of kraft paper that are large enough to cover your table? The ones I see are usually wrapping paper sized. Would you share where you purchased those adorable plates & the table runner? Everything looks so great! Just adore following your adventures! I've got white pumpkins in a lantern and one Thanksgiving plate up. That's the extent of my fall decorating. OH WAIT! I've got a Thankful banner too! I'm festive too!!!!! GO ME! You are the holiday queen!! Those new plates are adorable!! It's refreshing to see someone decorating for Thanksgiving!! I never skip this holiday and LOVE LOVE LOVE seeing all the special touches around your home. Those kid plates from PBK are amazing. Your house is so warm and inviting! What a great place to make such precious memories with your family. Your house is so beautiful and festive!! I love the idea of using the ornament tree as a thankful tree. You are one smart cookie! Your home looks so warm and inviting. Where did you get your kids' table? Looking for one for me littles. Love the Pottery Barn plates! LOVE the plate with Luke's hand turkey. How do you keep your house so clean with 3 kids and all you do?!? !